There are a few things to keep in mind while installing Microsoft System Center Data Protection Manager. One thing worth noting is that Data Protection Manager 2007 (‘DPM’ from now on) does not support being installed on Windows Server 2008 at the time of this writing. You will need to prepare a Windows Server 2003 machine. I’m using a Windows Server 2003 x64 Enterprise Edition with Service Pack 2 for this purpose. 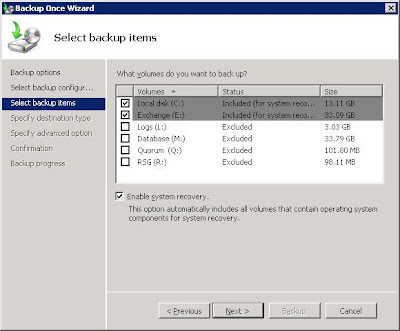 Another important thing if you are installing DPM to protect Exchange Server 2007 SP1 running on Windows Server 2008 – you need a DPM hotfix to be installed for it to work correctly. The hotfix is KB950082 and it’s available from Microsoft Product Support. At the time of this writing, this hotfix has not been released in a rollup yet, but I’ve been told that it is a supported hotfix. I installed this hotfix on my DPM server and successfully pushed the DPM agent on all nodes of my Exchange Server 2007 Single Copy Cluster running on Windows Server 2008 Failover clustering.